A model of the interstellar medium having a fractal density distribution. 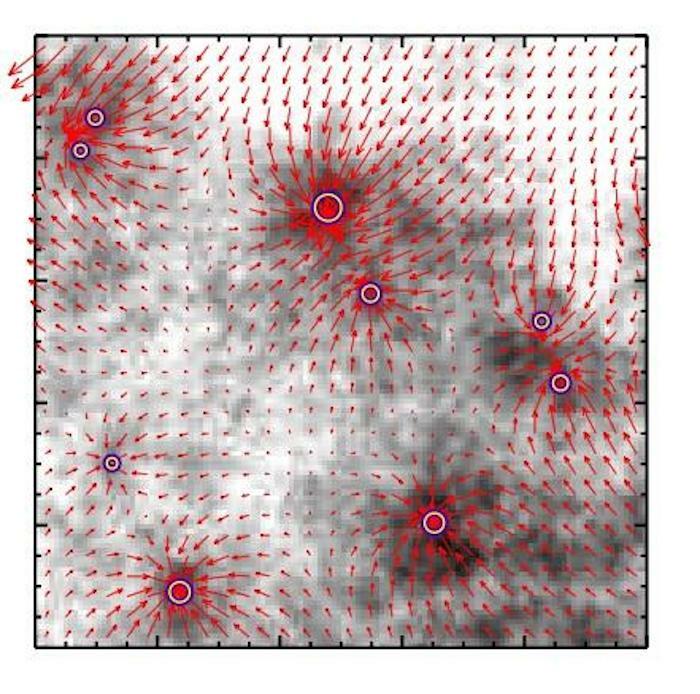 Dense cores where proto-stars are forming are marked and gravitational forces generated by them are shown. The Stellar Initial Mass Function is a function that describes relative fractions of stars having different masses in a stellar system or a ratio of big and small stars in galaxies. In 1955, the theoretical physicist and astrophysicist Edwin Salpeter was the first to derive this distribution law empirically in the Solar neighborhood using star counts (presently known as the "Salpeter initial mass function"). He demonstrated that the distribution of stars by mass has the shape of a power law with exponent of -2.35, i.e. the stars 10 times massive than our Sun are 102.35 = 220 times less frequent than Solar type stars. In the framework of this simple model, the scientists succeeded to theoretically explain the stellar initial mass function shapein just eight equations,which did not invoke any unjustified assumptions or extra free parameters required my many existing star formation theories. Igor Chilingarian emphasizes that all existing initial mass function theorieswere developed using "a classical astrophysical approach" and presented in long articles featuring dozens of pages of calculations and hundreds of formulae. "This work is the first of its kind and it creates a basis for a new interdisciplinary approach in astrophysics. We plan to further develop this family of methods and use them to studya broad spectrum of astrophysical phenomena in aspects of star formation and in observational cosmology such as a study of large scale structure of the matter distribution in the Universe", concludes Igor Chilingarian.